Our next step in this west coast adventure involved heading west several hours to tour the grand city of San Francisco. My brother has some friends who live in Berkely who had graciously invited us to stay with them. Ian and I joked that this was our first “tiny house” experience because we stayed in a converted shed in their backyard just big enough for a double bed, pack n play, and a couch. But it was perfect for our little family, and we enjoyed having our own space even while staying with someone else. 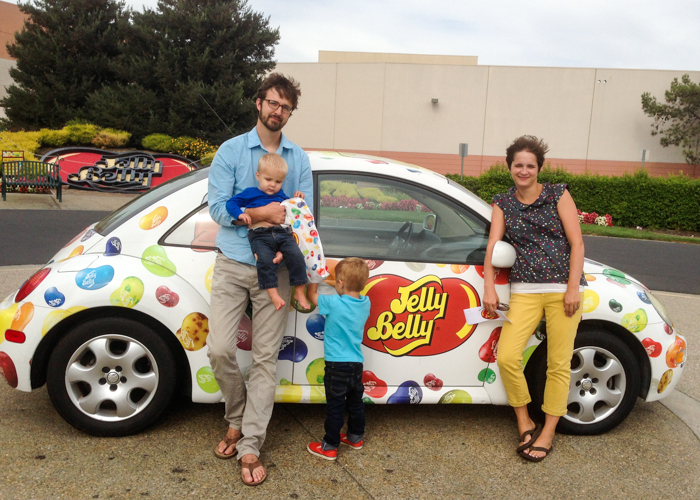 On the way to San Francisco we stopped by the Jelly Belly factory. Because we stopped by on a Sunday, the factory was not in operation but it was still fun to walk through the plant and see how the jelly beans are made. I had no idea that the process was so labor intensive. Of course the free sample bags at the end were a fun perk too! 🙂 Oliver’s trying to break into the car right here, per his usual antics. Lol. 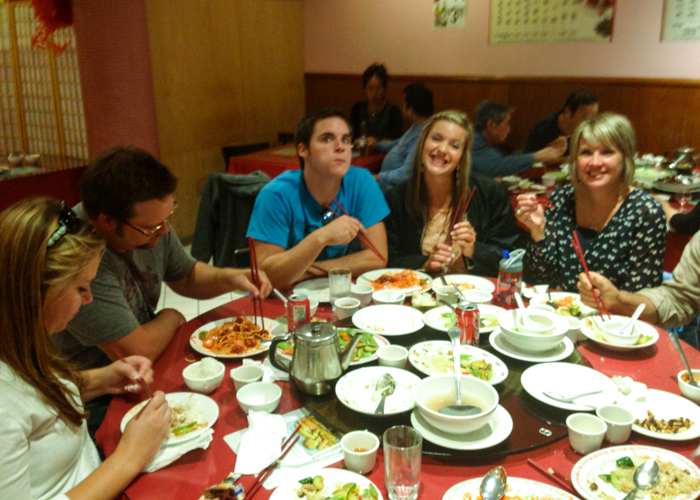 We got in to San Francisco early Sunday evening and wanted to go experience some of the town right away so we headed in to Chinatown for dinner. We went off the recommendation of our hosts and ate at a very authentic place called Kam Lok. It was my first authentic Chinese experience and while I was a bit scared we were all going to get sick, it was kinda fun to just immerse myself into the place and I actually really enjoyed all my food! We got one of the mix dinner options and got to try a bit of everything! For this section of our trip, we still had my parents and siblings with us and it was nice to have some family along to help entertain the boys and explore the city. Monday was our big sightseeing day. We left in the late morning and didn’t return until evening! We thought for sure we would end up coming back because the boys would be cranky but they proved to be great sightseers! Eliot loved hanging out in the ergo and Oliver did a great job walking all around the city! He was such a trooper to walk his little feet off and only asked to be held at the very end of the day. 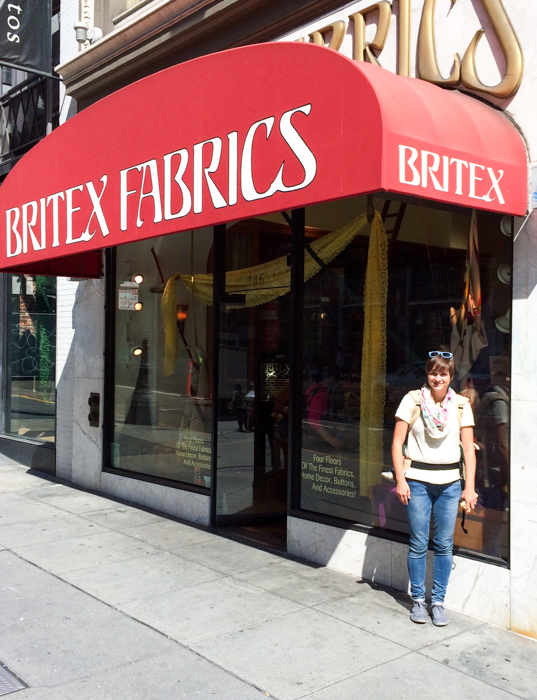 Of course we had to begin our day in Union Square so I could check out Britex Fabrics. What a fun store, but so overwhelming! Would you believe it, I got so overwhelmed that I ended up with just a little Dr. Seuss panel that I found in the clearance section of the store. I think this would be a great resource if I needed some particular type of fabric- like wool or home dec, but going in without a specific need, you end up with too many options. Also I noticed that their quilting cottons section was several dollars more per yard than regular fabric stores who carry the same lines. 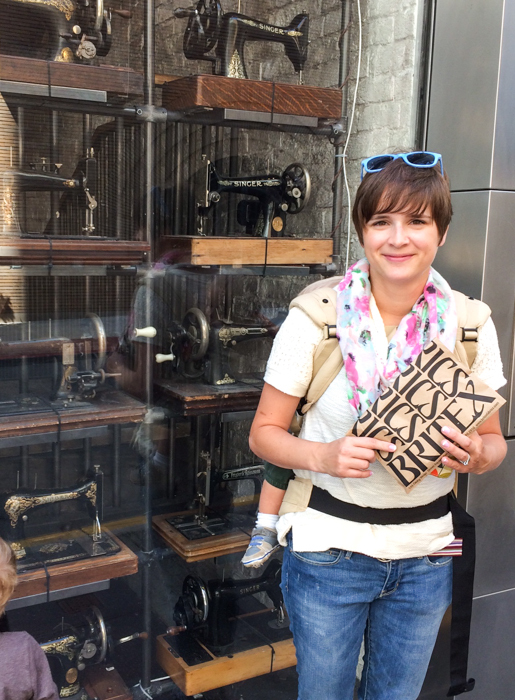 I loved this wall of vintage sewing machines though! We left Union Square and took the cable car down to Fisherman’s Wharf. Definitely recommend that experience. 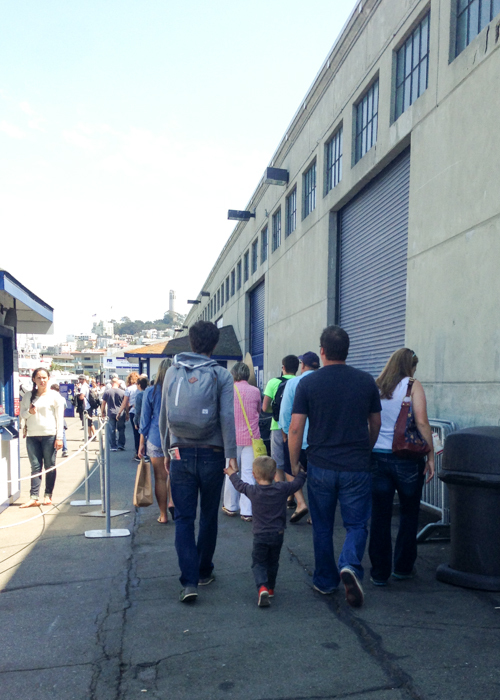 Fisherman’s Wharf was full of fun sights and sounds for the boys to take in. 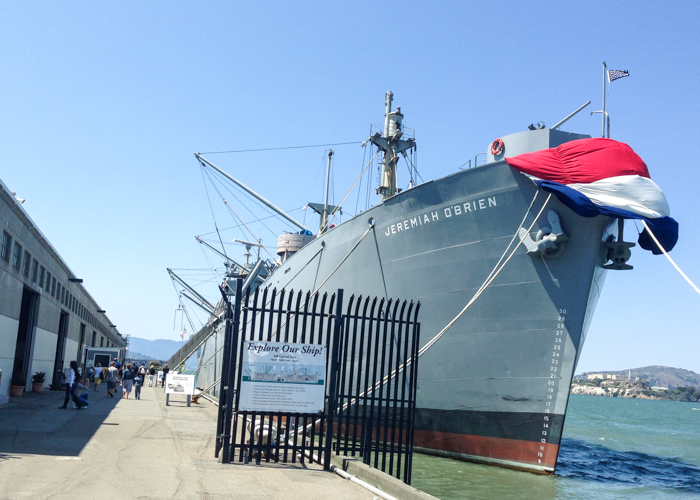 There were some big ships docked and a cool museum of video games (from the 1900s on!). 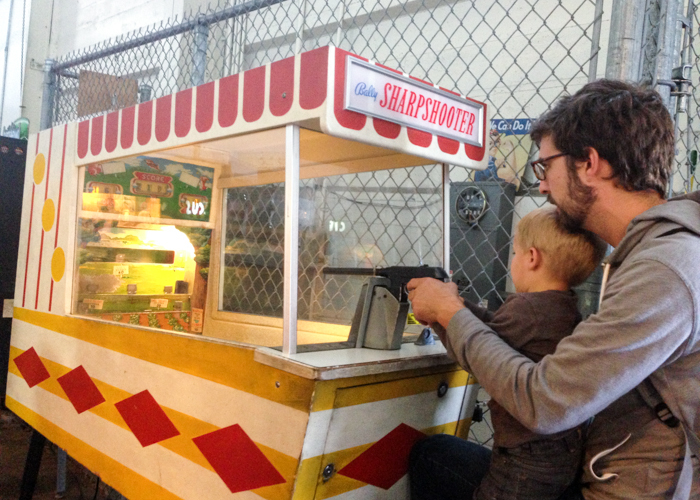 Most of the video games were functional and only cost the original amount to play so the boys got some quarters and played 3 different games for $1 total! 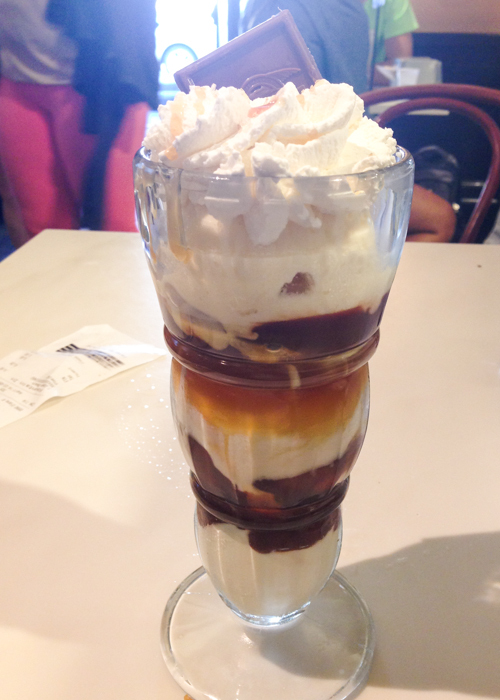 We walked up to the Ghirardelli store and decided to be typical tourists and ordered a big sundae to share. I have to say that this is one thing I think was way overrated. Yeah the ice cream was fine but we had even better ice cream later on in our trip for a third of the price! Down from the Ghirardelli store was a nice big grassy area where the boys enjoyed running around and watching the boats sail back in forth in the bay. Oliver loved having Daddy and Uncle Joe to swing him around! 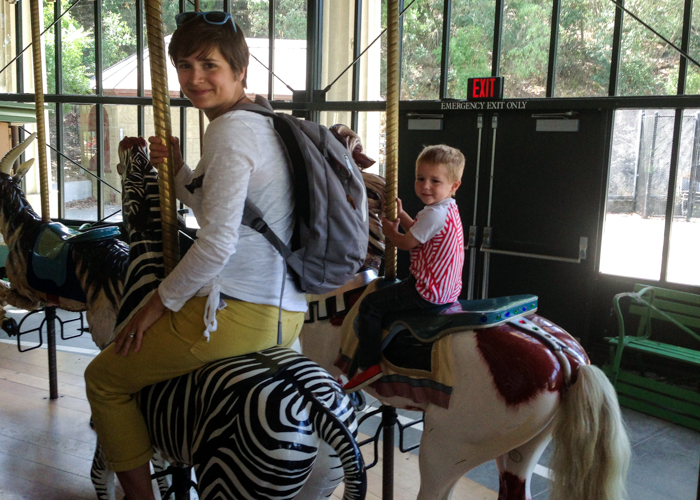 Tuesday we knew would need to be a laid back day to help the boys recover from Monday’s big excursion so we headed to Golden Gate park and had fun riding the carousel, playing on the playground and seeing the San Francisco skyline from the DeYoung museum’s tower. Definitely recommend that for a great free view of the city. Then we met up with my family at the Golden Gate Bridge viewing area and said goodbye to them as they were headed back to the airport that afternoon. I loved how beautiful the area was down here! 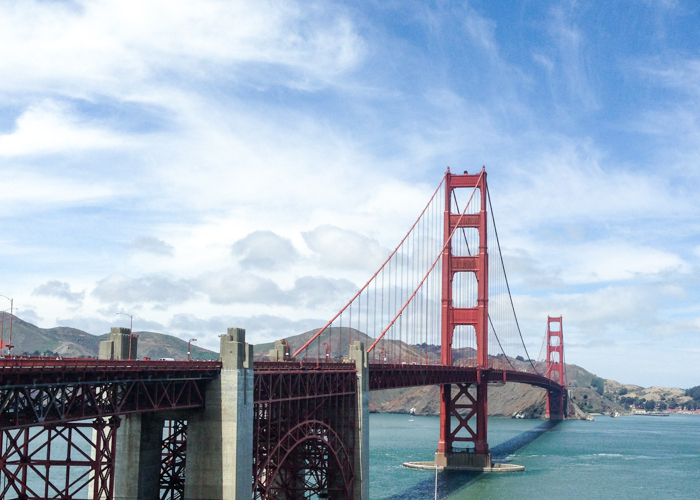 San Francisco is such a gorgeous city and we had amazing weather to explore the sights. 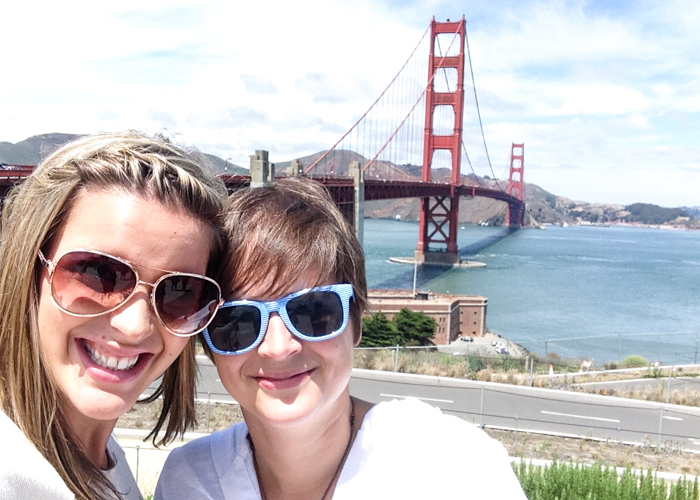 Me and my sissy taking a selfie in front of the bridge. And we aren’t really trying to be too cool for school. The sun was so bright that our eyes were all squinty without the sunglasses! We made a fun impromptu Ikea stop on our way home from the bridge because traffic was so bad and we were all getting a little hangry. Thankfully we spotted an Ikea right off the interstate so we stopped in for a bite and to let the boys run around a bit in the kid’s section. I always love an Ikea visit! Once we got back to our host house, we decided to go ahead and pack up our stuff and begin our next trek that evening so we could get a few hours of driving in while the boys were asleep. Brilliant idea as they fell asleep as soon as we left and we had 5 hours of nice, quiet driving before stopping for the night. 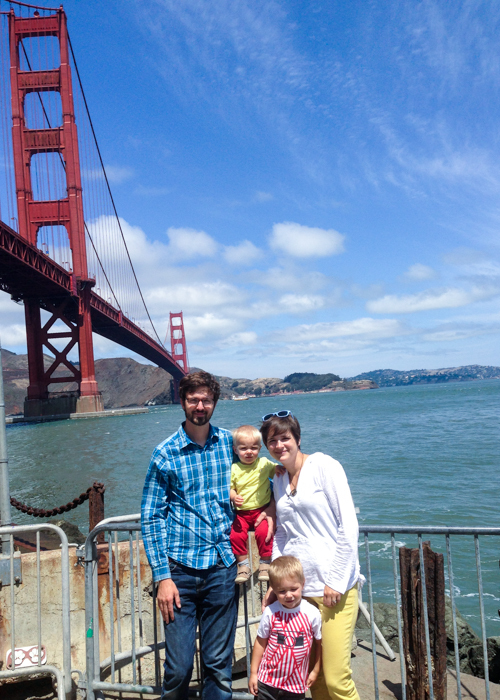 This entry was posted in Travel and tagged california travel, travel tips with kids by oliver's fancy. Bookmark the permalink.